Admin can conduct any format of paper with any number of question asper his / her requiremnt. Student can select any of paper as per his convienient in case of object an instant result will be shown while in case of subjective part after admin scoring of answer one can get result. For more detail watch video. 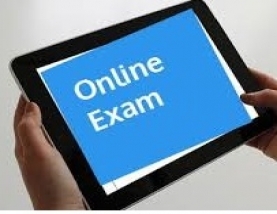 Online examinations are an important method of evaluating the success potential of students. This research effort the individuals under consideration were students who would be enrolling in computer courses or Technologies Registrations. A prototype of a web-based placement examination system is described from the standpoint of the research effort, end user, and software development. An on-line educational system including exam processing and electronic journal features. An instructor builds a course based questions which on-line contain in identification of assignments. Which are compiled into an on-line exam syllabus? Users enrolled in the platform may access the electronic details they provided and perform various functions with the on-line educational system in order to participate in the on-line examinations. Users can receive an on-line exam, having multimedia content, for the course, and they can electronically provide answers for the exam. And after Completion of their duration of exam they are provided the grade or marks secured in their examinations. Design is the first step in the development phase for any techniques and principles for the purpose of defining a device, a process or system in sufficient detail to permit its physical realization. Once the software requirements have been analyzed and specified the software design involves three technical activities - design, coding, implementation and testing that are required to build and verify the software. The design activities are of main importance in this phase, because in this activity, decisions ultimately affecting the success of the software implementation and its ease of maintenance are made. These decisions have the final bearing upon reliability and maintainability of the system. Design is the only way to accurately translate the customer’s requirements into finished software or a system. Design is the place where quality is fostered in development. Software design is a process through which requirements are translated into a representation of software. Software design is conducted in two steps. Preliminary design is concerned with the transformation of requirements into data. The DFD takes an input-process-output view of a system i.e. data objects flow into the software, are transformed by processing elements, and resultant data objects flow out of the software. Data objects represented by labeled arrows and transformation are represented by circles also called as bubbles. DFD is presented in a hierarchical fashion i.e. the first data flow model represents the system as a whole. Subsequent DFD refine the context diagram (level 0 DFD), providing increasing details with each subsequent level. The DFD enables the software engineer to develop models of the information domain & functional domain at the same time. As the DFD is refined into greater levels of details, the analyst perform an implicit functional decomposition of the system. At the same time, the DFD refinement results in a corresponding refinement of the data as it moves through the process that embody the applications. A context-level DFD for the system the primary external entities produce information for use by the system and consume information generated by the system. The labeled arrow represents data objects or object hierarchy. This application avoids the manual work and the problems concern with it. It is an easy way to obtain the information regarding the different scheduled examinations information that are Currently issued. Well I and my team members have worked hard in order to present an improved website better than the existing one’s regarding the information about the various activities. Still ,we found out that the project can be done in a better way. Primarily, when we request information about a particular schedules it just shows the exam date and platform. So, after getting the information we can get access to the onlineexaThe enhancement that we can add the searching option. We can directly search to the particular student details from this site.